The Stat-X First Responder is an emergency fire suppressor tool to add to your arsenal of tools you will want on hand to determine the best attack on the fire. 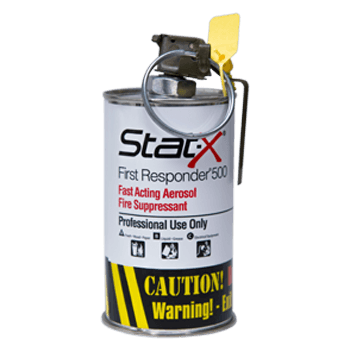 Stat-X First Responder excels at containing and suppressing small fires in an enclosed space before it becomes unmanageable and requires a fire department with water. The use of water increases the damages, downtime, and the cost of recovery. Many times, a police officer is the first to arrive at the scene of an emergency. If the officer’s vehicle is equipped with a pair of Stat-X First Responder® in a carry case in the truck. Our portable tool can be tossed into an active fire. This quick response will bring sizable benefits to rescue individuals from structures or vehicles. Police arrive at a vehicle fire because of an accident. There are occupants trapped in the burning vehicle and the fire department has not yet arrived. Break a window, toss the Stat-X First Responder into the vehicle to knock down the fire and remove the occupants.